If you haven’t noticed, there’s a small icon at the bottom of the page that reads “sitemeter”. This free app tracks interesting stuff like how many hits the HDLPGA site gets and where those hits come from (Big Brother is always watching!). So far the most I’ve had in a single day has been 220, which was on Friday May 30. I was live-blogging Round Two of the Ginn Tribute from the course that day. That total beat my second-best day by more than 50, so it looks like you guys want me to do more of that! How many vacation days do I have left? Aside from my home page, the two pages that always rank near the top of the “daily most viewed” list are the Favorite Women Golfers page and the June 2007 archive page, which just happens to contain the Favorite Women Golfers page. I assume this is because they get found when somebody does a Google Image search for Gulbis or Creamer. That trend is going to continue because they are still among my Favorite Women Golfers for 2008. For the third straight year, far and away my top choice. I should have expected that she would not have been playing in the Ginn Tribute pro-am but I was still extremely bummed about not getting any new pics of Grace. The one above is still my fave from the 2006 Atlanta event. She must have been at the range and putting green early on Wednesday. I did get to see her play 2.5 holes Thursday and the final two holes Friday. The epitome of the American standards for feminity and purity and she’s among the top five players in the game, to boot. As a result Paula is the most over-exposed player on Tour, exceeding even Natalie Gulbis’ levels. That doesn’t bother me in the least. I discovered Louise’s website just as the season began. I was immediately captured by her openness and impressed by the frequency of her diary entries, typically four times a week during events. She writes her LPGA rookie blog entries the same way, with the detail and enthusiasm that most of those blogs usually lack. When she came from ten shots back on Sunday to win the MasterCard in Mexico (sadly, not on U.S. TV), it seemed as though a distant cousin of mine had succeeded and I felt strangely proud of her for the accomplishment. As rookies often do, Friberg has had a few more downs than ups since that weekend in March but she’s on the short list of players I look for first on the board every day. Kim recently got engaged to Won Hee Lee, the fellow in this picture. He’s an Olympic judo medalist. 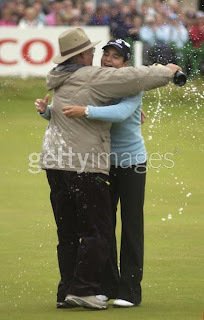 Evidently her parents didn’t hold her to that promise that she had to win a major before they would let her get married! Maybe Hee-Won Han intervened on her behalf. I can’t decide if my favorite image of Peanut is her striking a fairway wood or rolling a 20-foot putt. Lee quietly goes about her business of winning one tournament per year (she has five months left in ’08 to inprove that ratio). She never calls any attention to herself – she’s even stopped wearing those short shorts that grabbed MY attention two years ago – and that’s a big part of why I love watching her play. What I've said each of the last two years about Natalie still holds true today, but I’d like to append to that. There isn’t a more fan-friendly (or tournament-volunteer-friendly) player on Tour, from what I’ve seen and read. Knowing the kind of garbage she has to put up with every day (especially on the internet), that’s especially amazing to me. JJ has lost in two playoffs over the last eleven months and the things I remember most about them – she hugged Gulbis while saying “you did it!” in reference to Natalie finally getting that first win, and after losing to Leta Lindley she bent down smiling to say a few words to Lindley’s young son who had come out onto the green. I have taken on Jelly as a personal project. It is one of my duties to keep reminding you that she is one of the ten best players in the world despite the fact she hasn’t won since late 2005. Her game has often reminded me of Ochoa’s and Pettersen’s. Although she is a little more than four years younger than Ochoa and nearly five younger than Pettersen, Lee is at least ten years behind each in golf experience, having only picked up the game in her mid-teens. If the injury demons stay away, Jee Young Lee will become the first Korean golfer to ever win Player of the Year, Rolex #1 status and the top spot on the HD chart. And I will say “I told you so” when it happens. Lorena was close to making this list in both of its previous incarnations. Why is she here now? In other sports that I’ve followed, after a team or player dominates for a couple of years, I naturally tend to root against them. That’s even happened with the LPGA. I don’t dislike Annika Sorenstam but I certainly haven’t rooted FOR her in the last five or six years at least. That hasn’t happened with Ochoa. There are too many obstacles to overcome - her generosity, her sunny disposition with fans and other players, her devotion to family. I can’t get around all of that and force myself to hope that she fails. I’m a Lorena Ochoa fan. We should all root for Christina to be near the top of the leaderboard just for the increased entertainment value of the post-round interview notes at lpga.com. Nobody interviews better than X-Tina.